When it comes to celebrating Halloween, it’s film — not music — that is the popular art form that has best defined and shaped this most spooky of holidays. Ask anyone to name a scary theme from Halloween and the smart money says they’re most often drawing on ideas and motifs popularized in the movies. Fear-lovers and vampire-wannabes get their undead blood pumping from old-fashioned, low-tech, slasher flicks as well as a big-budget, supernatural thrillers. And what besides the great Universal horror classics — “Dracula,” “Frankenstein,” “The Wolf Man” and “The Mummy” — have enshrined characters that are costume staples no matter what the year. But, in reality, children and adults really don’t have any carols to sing while trick-or-treating. Well, let’s bury the notion that music can’t scare you right now. I’ve compiled a playlist of the very best Halloween songs that don’t have the respect of their cinematic brethren and surely deserve a place of honor. Maybe the kids won’t be singing all of these as they go from house to house, but these tracks should be on the iPod they’re listening too under their mask. While supernatural tales dealing with the devil and evil were thematic fixtures in many folk and blues music in the early 20th Century, it was Black Sabbath that was the music industry’s definitive answer to Hollywood’s development of the horror film genre. The fact that Black Sabbath essentially invented heavy metal at the same time will forever cement the group’s legend as the purveyors of musical nightmaresAs the members of the Birmingham, England-based combo tell the story, the quartet was a typical blues band in the late ’60s. They were rehearsing across the way from a movie theater when one of them remarked about the oddness of people paying money to go see a film and get the heck scared out of them. Right then, the band renamed themselves after a B horror movie and brazenly pursued songs that delighted in their evil overtones. 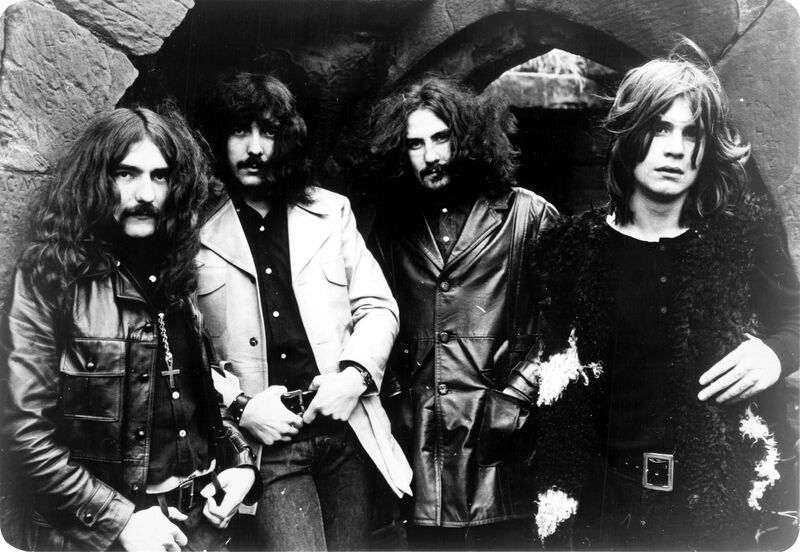 The musicians’ grim existence — braving poverty, substance abuse, factory work and the bleak Birmingham environs — further informed the music’s dark, nihilistic qualities.Of all Black Sabbath’s canon, the band’s namesake song is without a doubt their most frightening masterpiece. The tune begins with some sonic staging — sound effects of thunder, rain pouring and a church bell meekly ringing in the background — that set the scene for the terrifying visions to come. Enter some of the most menacing sounding riffs and you’ve entered Sabbath’s evil world.What makes this track even creepier is that the protagonist in the song’s encounter with a black-clad figure is apparently based on a true story. According to legend, bassist Geezer Butler had developed an interest in the occult and was reading a few too many books about Satanism and the like. He said he awoke one night to see a demonic figure looming above him. Singer Ozzy Osbourne is credited with writing the lyrics that slowly document Butler’s diabolic meeting. If bluesman Robert Johnson’s devil is at worst a trickster, the Lucifer in “Black Sabbath” is a more sinister, threatening figure. The band has created the perfect soundtrack for this the ultimate freak-out experience. What makes “Thriller” the song so remarkable is what made “Thriller” the album such a phenomenon, namely its unexpected ambition.Music fans might have expected a pre-“Thriller” Michael Jackson to record a new album that was clearly geared to please his constituency of R&B/pop fans. But instead of limiting himself to just creating a better dance-floor jam, Jackson and producer Quincy Jones set their sights higher and sought to develop what is the ultimate crossover classic.When it comes to the album’s disco-perfect title track, few would have expected Jackson to create a funky, danceable homage to horror movies. On paper, the idea of song the features a “rap” by Vincent Price and has a video in which Jackson struts around with gore-spewing zombies might have appeared like career suicide. Instead, Jackson and Jones let their scariest fantasies run wild and formulated Jackson’s biggest smash hit. Featuring Jackson’s most electric vocal performance and built on a zigzagging, digital clavinet and a complicated, xylophone-like pattern of drum machine syncopation, the track is as mesmerizing a pastiche as Frankenstein’s monster.The song is the ultimate Halloween anthem. The video is probably even more renowned then the song and it hasn’t lost its powers of shock and suspense in the last 25 years. This is a bit of a dark horse selection for the list, but “Day Of The Lords” is an underappreciated gem in Joy Division’s limited discography as well.The bellowing, monotone Ian Curtis often sounded slightly out of place in some of the group’s better-known cuts. Like Nico, Curtis’ vocal stylings are unique and patient listeners could appreciate the nuances of his oft-putting performances. What was the problem? His tone. Curtis might have idolized the Doors’ Jim Morrison, but he struggled to instill the same emotionality in his vocals that the Lizard King could manage most times. On “Day Of The Lords,” Curtis and his formidable bandmates have finally found a sonic vehicle that suits his dry delivery. Bernard Sumner’s guitar swipes back and forth against the melody, squawking and clawing while bassist Peter Hook creates a rolling thunder the simultaneously thumps listeners’ heads and lurches the tune forward.Curtis’ voice is the perfect tour guide for this hellish journey. His lyrics are overwhelming in their misery. “There’s no room for the weak/There’s no room for the weak,” he hisses, before howling at the song’s climax, “Where will it end?” Closet goths around the world have one answer: Hopefully, no time soon. There’s little to fear with the rollicking piano ditty that forms the basis of Warren Zevon’s “Werewovles Of London.” Rather, the song’s zaniness makes it an essential.Zevon was a lyrical iconoclast although musically, he could be much more explicitly sentimental. This made him a less syrupy composer than say, Billy Joel. At the same time, it also made him the kind of artist who wasn’t tough to love.”Werewolves Of London” is Zevon’s commentary on fame and the jet set crowd. He disguises his disgust for the fashionistas around him in monster-movie language, but the horror that he’s recoiling from is the silliness and plasticity that he’s witnessing on the rock ‘n’ roll circuit.The verse in which Zevon name checks Lon Chaney Jr., the too-often overlooked star of “The Wolf Man,” earns him extra points from anyone who is a sucker for big dumb compassion. This is definitely the creepiest song on the list and probably the one that is most often dredged up by rock radio to play on Halloween.The cut is a goth-music classic and yet, while many fans would be tempted to break out their lighters to see the band perform the song in concert, doing so might cause the vampires around you to flee into the shadows. While the instrumental trio of Bauhaus developed a spindly tapestry of noir-ish sounds to mimic all types of ghoulishness, the song’s star is its over-the-top narrator, Peter Murphy. His deadpanned delivery drives the song and gives it a morose character that would define the band and an entire musical genre. As an extra treat, I’ll make one more Halloween song selection. While Gnarls Barkley’s debut “St. Elsewhere” is best known for their monster hit “Crazy,” there are more treasures a few clicks down on the track list. Tucked deep into the record’s shrouded second half is “The Boogie Monster.” To the tune of creepy organs and lumbering like a reanimated creature, vocalist Cee-Lo and producer Dangermouse take the “Monster Mash” and update it for the 21st Century. The song’s tone is more akin to a Disney conception of shocking, but this doesn’t distract from its allure. Tags: Bauhaus, Black Sabbath, Gnarls Barkley, Halloween, Joy Division, Michael Jackson, Monster Mash, October, songs, Thriller, Warren Zevon. Bookmark the permalink.